A few years ago I dabbled in scanning flowers on my Epson flatbed scanner and got some pretty good results. The technique works best if you can cover the flower arrangement with a dark piece of fabric or black cardboard. While the original images were nice “record” shots of my flowers, I wanted to do something more with them. I ran the scanned images through some artsy Photoshop filters to give them a romantic, soft-focus glowy look. So there you have it…photographs without a camera! Not long after I toyed with the process, I saw an exhibit of photographer Robert Creamer’s images at the Smithsonian National Museum of Natural History. These large-scale works were amazing! He scanned all sorts of things—dead birds, flowers, fruit, bones, and more. You can read more about his Smithsonian exhibit here and see more of his work on his website here. Watch the video here for a demonstration of his setup. One blog led me to another and I stumbled onto “Lull,” the lamp that opens and closes like a flower! It’s designed by Varmo, an award-winning Norwegian design group. Clever folks, those Norwegians! Check out the Lull website here: http://www.lull.no/ Below is an animation of how the lamp works. Picture this. Miami. Christmas Day. 1991. With no plans to visit our respective families for Christmas that year (no particular reason not to either), we declared that Christmas must be spent in the Everglades National Park. We loaded up the car with cameras and camping equipment and embarked, with unbridled enthusiasm, on Great Aventure #17 (remember, this was early on in our courtship, so the adventures hadn’t stacked up just yet!) to the Everglades. What surprised us most is how close the park is to Miami. One minute you’re at the mall, the next minute you’re surrounded by alligators. Camping + Nachos + Steve Martin = It Must Be Christmas! Michael, master camper that he is, set up a fine tent. It was getting late and we were too impatient to cook over a campfire (okay, so I was the one who was too impatient), so we did what any camper would do if they were just a mile from a city—get in the car and drive to a Mexican restaurant, followed by a late showing of the newly-released movie, Father of the Bride. Mexican Food and a chick-flick. How Christmas-y is that? Gators + Marshmallows + Open Boat = Are You Kidding Me? One afternoon we booked a tour on an airboat that took us through the glades to spot alligators. At one point the guide spotted a rather large one, slowed the boat down, then tossed out a marshmallow in its direction. The guide then joked (insert Captain-Clint-from-Jaws voice here), “Aye…ya know…he could scamper onto dis boat in no time flat if he really wanted to…arghhh.” The group was so silent, you could have heard a marshmallow drop. Do You Get The Feeling We’re Being Watched? 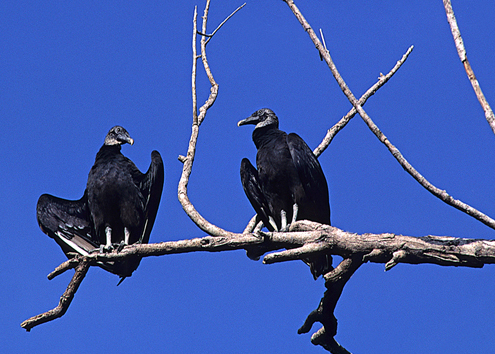 I photographed these Black Vultures in a tree overlooking our campsite. In retrospect, I think these vultures must have seen our license plates, figured we were lost Yankees, and were just waiting for us to run out of prepackaged R.E.I. meals and simply perish…our bodies ripe for the picking. Little did they know that in town we had supplemented our MRE’s with refried beans, enchiladas, buttered popcorn and Nonpareils. We lived to tell the tale.